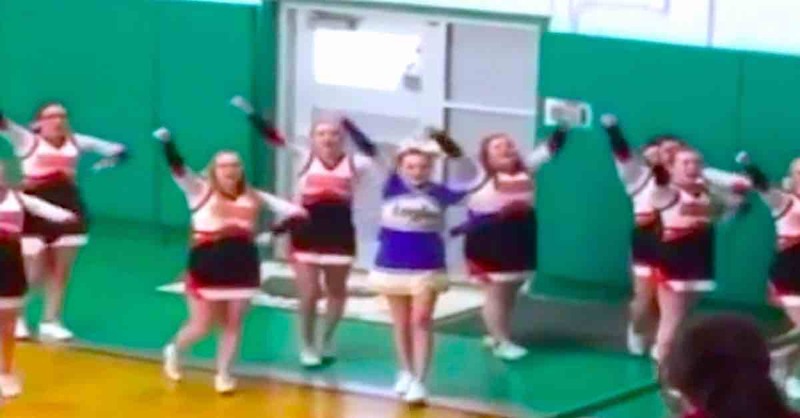 There may have been a basketball tournament going on in Carroll County, Missouri earlier this week, but the actions of a group of cheerleaders stole the show. The footage in the video from the CLAA conference’s basketball tournament was sent to WDAF Kansas City by a mom named Brenda Milligan, whose daughter is a cheerleader for Hardin-Central High School. Milligan’s daughter was part of a group of cheerleaders who noticed that the opposing team, Northwestern, only had a single cheerleader on their side. “She was embarrassed and scared, just like any of us would be if we had to cheer in front of a big crowd all alone,” Brenda told WDAF. But the cheerleader wouldn’t be alone for much longer. The lone cheerleader from Northwestern, Tori Adams, said that she had been performing alone because many of her teammates were sick. The game had also been rescheduled, which conflicted with other members’ prior commitments. Nonetheless, she was thankful the opposing squad joined her.